This custom made 14k gold necklace gives you the best of both worlds! Instead of choosing between a circle and square pendant, we included both! 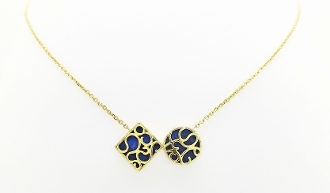 The pendants feature intricate swirls and have a lapis lazuli stone set in back of each pendant. This is a one of a kind necklace that you will definitely want to get your hands on! Diameter of Pendant: 0.62" x 1.10"